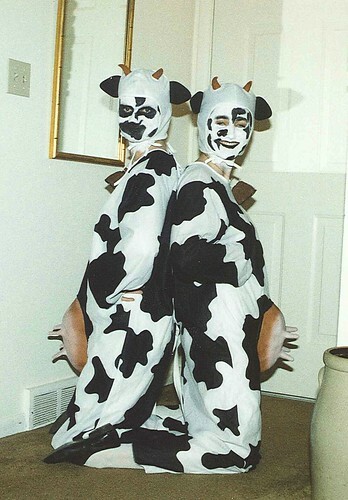 I couldn’t help but think of this 1991 picture of Quinn and her friend Tracy when I saw this offer on “Hey, It’s Free!” So I passed the offer (show up at Chick-fil-a in a head-to-toe cow costume and get a free meal) on to Quinn, asking if she still has her cow costume. For as many times as she’s moved since her high school days, I imagined the answer was no. But who could pass up an opportunity to remind her of her crazy youth? Mid-afternoon, Dusty sent us the result of Quinn’s challenge to get creative. 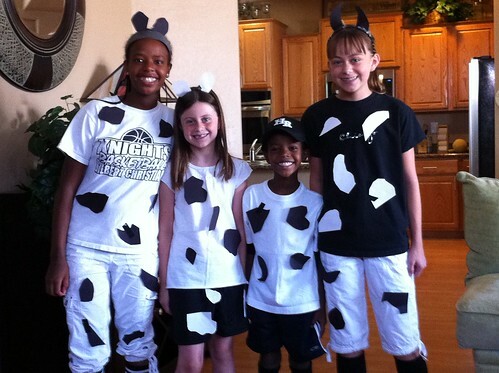 Off to claim their free meal!